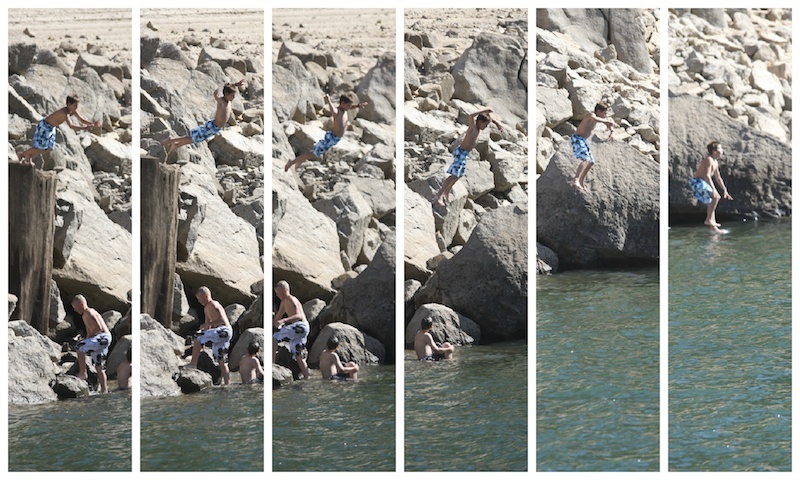 When the boys weren't in the boat, they were climbing and jumping off rocks. 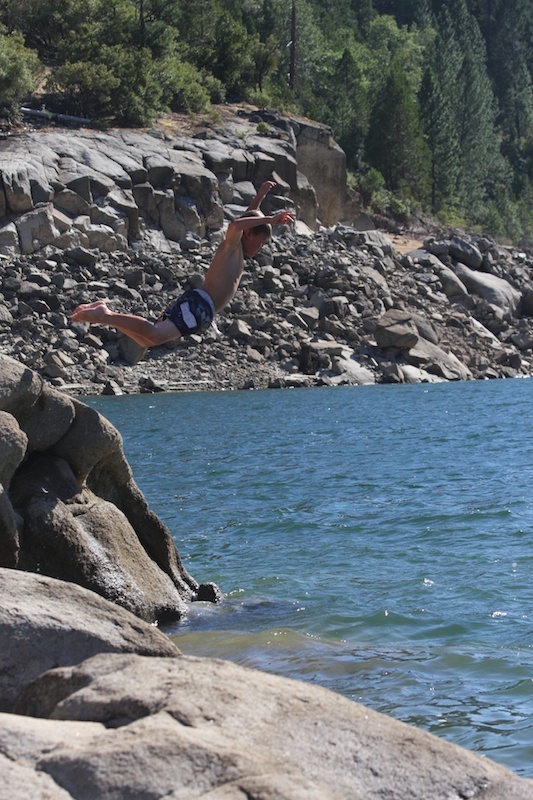 They started off at the 'slow' lake. We call it slow because there's a speed limit and you can't tow tubes or water-skis. 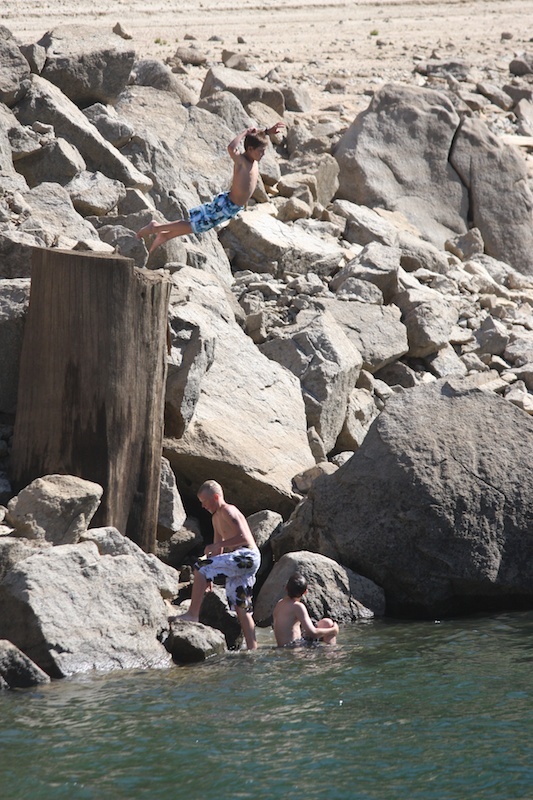 This was the 1st time youngest Danny, age 7, jumped off a pretty big rock. We were all cheering him on! 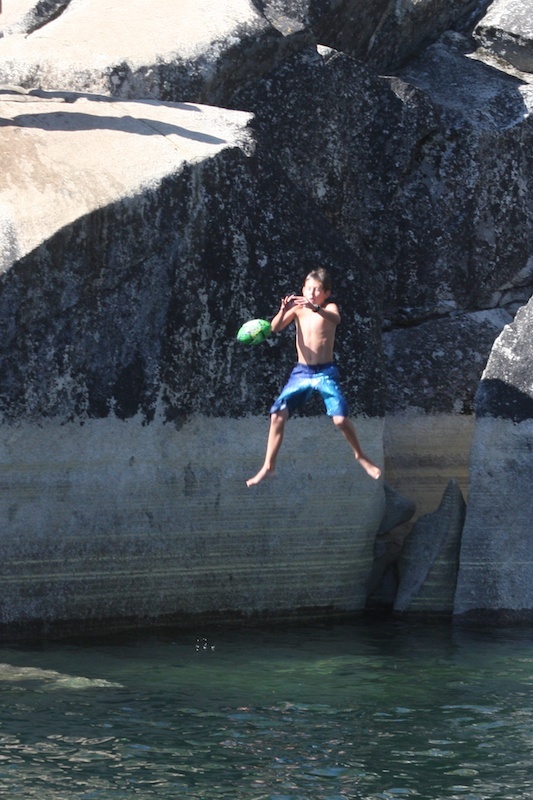 This rock was old hat to the older boys, so they added another element to it...catch a football in mid-jump. It was quite a challenge and only 1 of the 5 older boys was able to catch it and keep a hold of it, oldest brother Reggie. Though middle Jakee certainly gave it great effort! 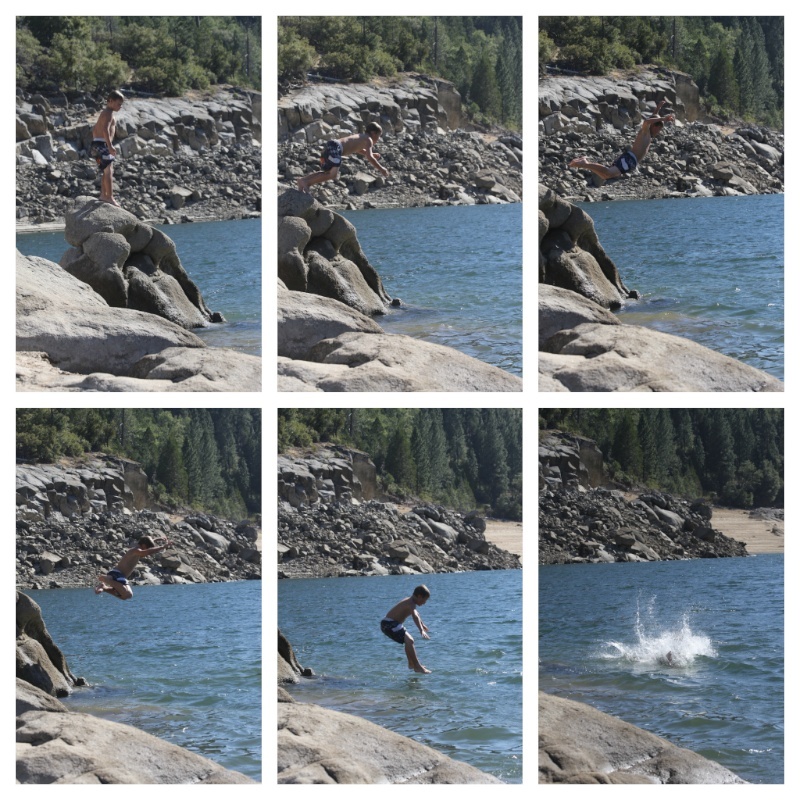 The next day we went to the big lake, which offered bigger jumps. They boys found a tall tree stump to jump from. 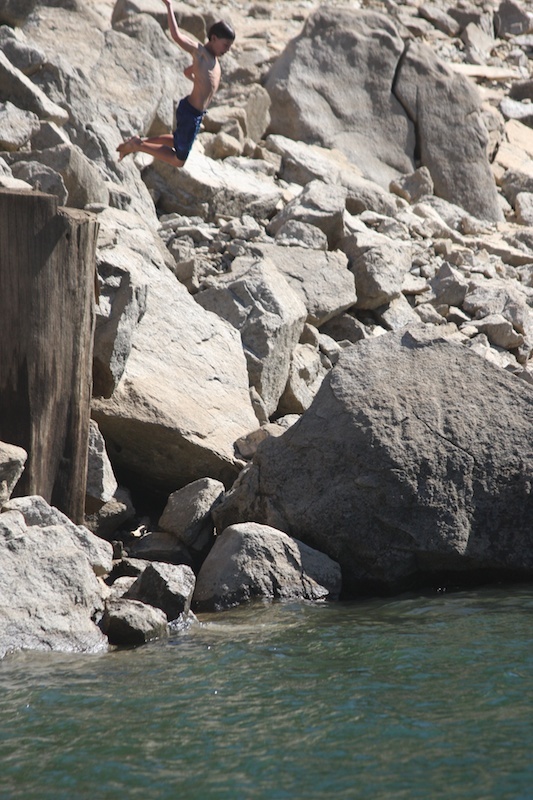 11 year old Reggie takes the 1st jump. Notice in the 1st image that the log is completely out of the water. (click to enlarge). They needed to seriously push off that log to clear the rocks and ground below. (Yes, my heart was palpitating furiously). Middle child Jakee was right behind his big brother. 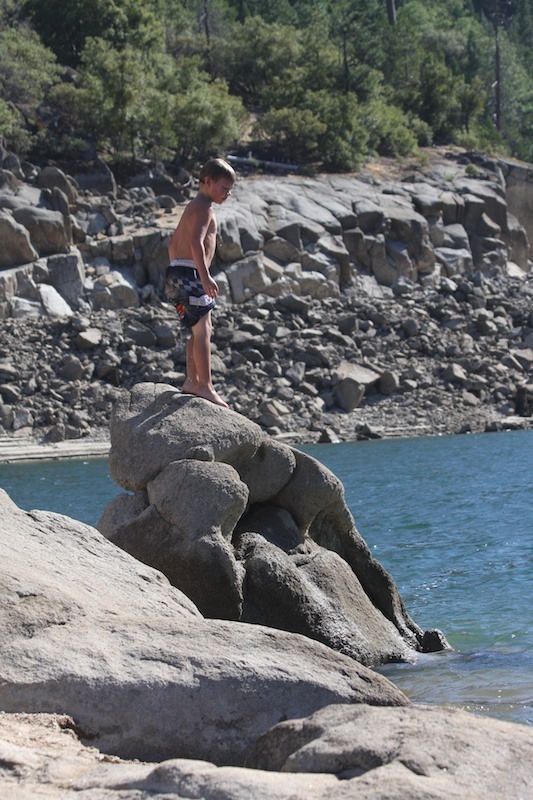 He told his dad that one of the times, his foot touched the bottom. But that didn't stop them from doing it over and over again. 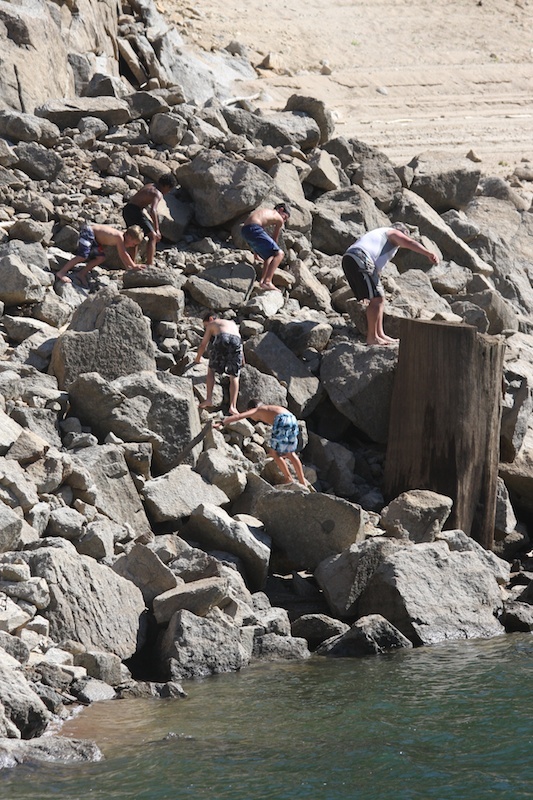 They'd climb back up those rocks like mountain goats. 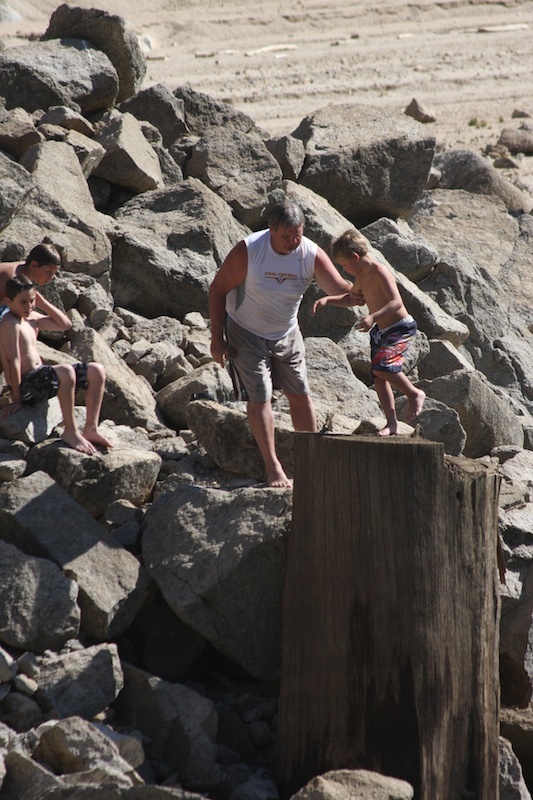 Their dad, Jimmy's older brother, had to show those boys that not only can he jump off that tall stump, he could dive off it. 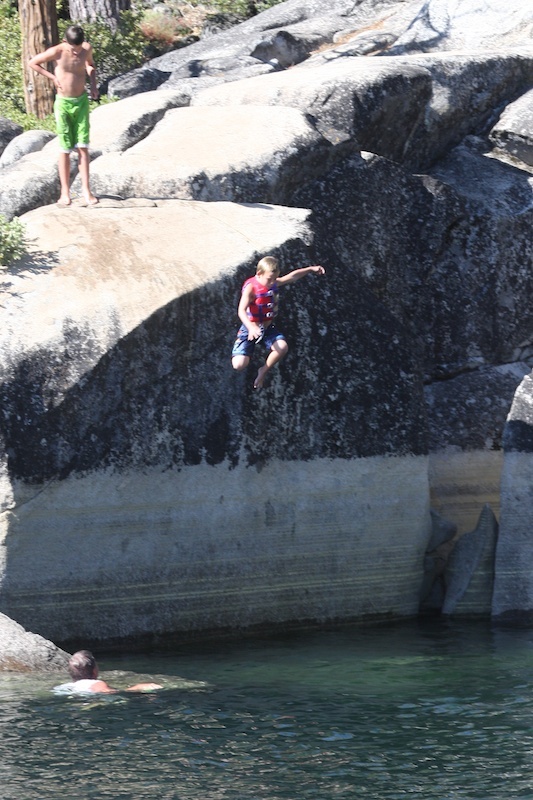 He was happy to jump off the less risky rock. which was tall enough for him and when he looked down, he saw water, not land. He's got great form though. 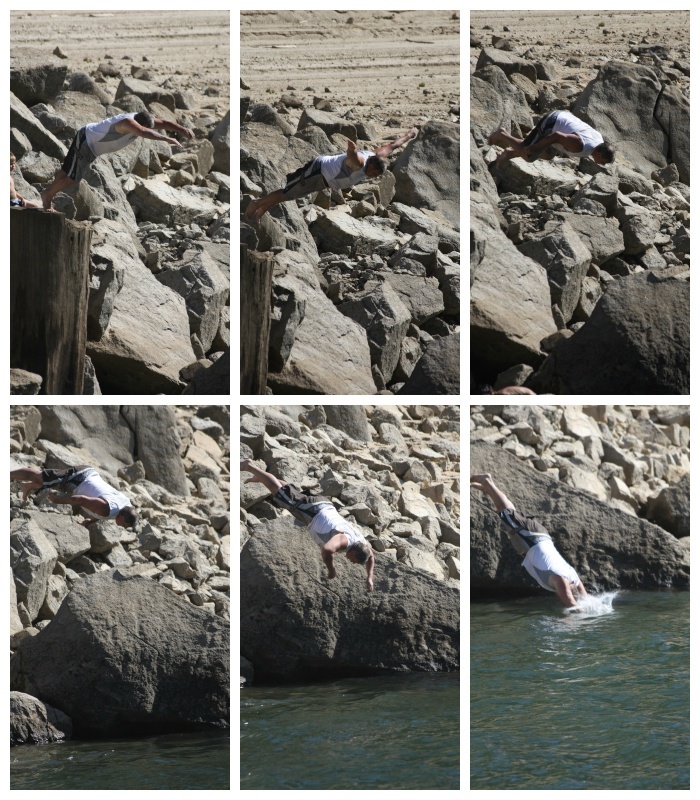 Nice push-off from that rock. It won't be long till he'll join his older brothers on those big jumps. 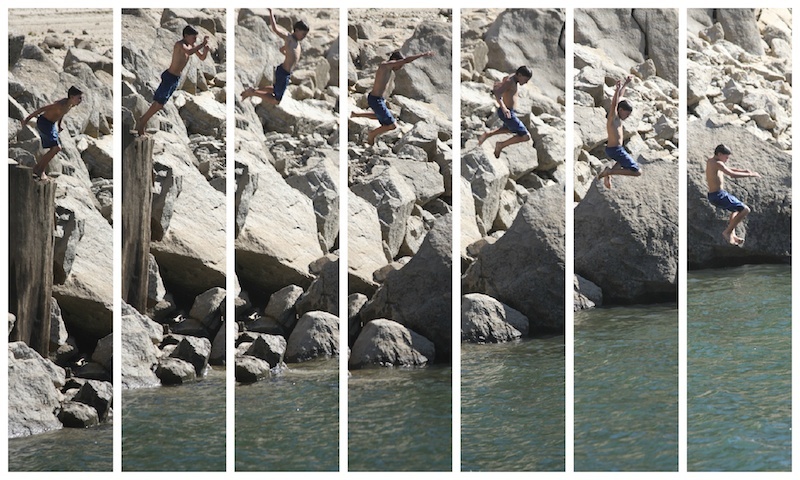 Great sequence of photos - I love how brave wee Danny was - he made a great jump. 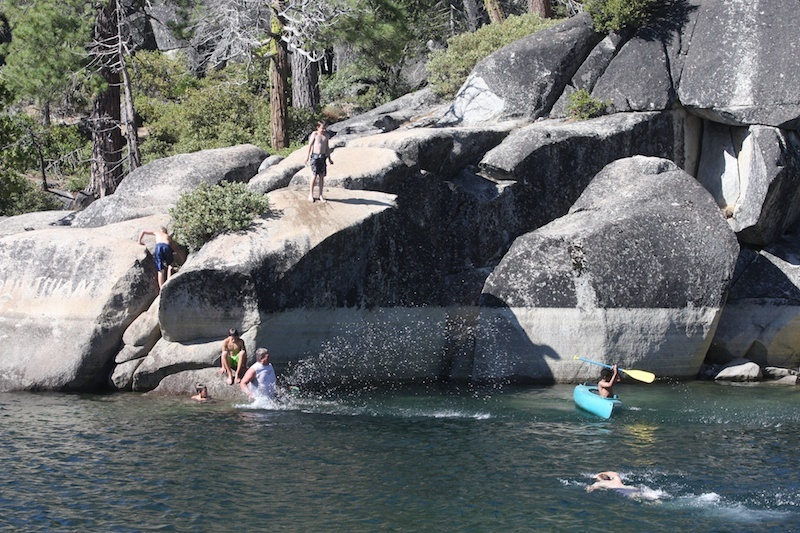 No wonder they love the camp - it is one huge adventure playground.